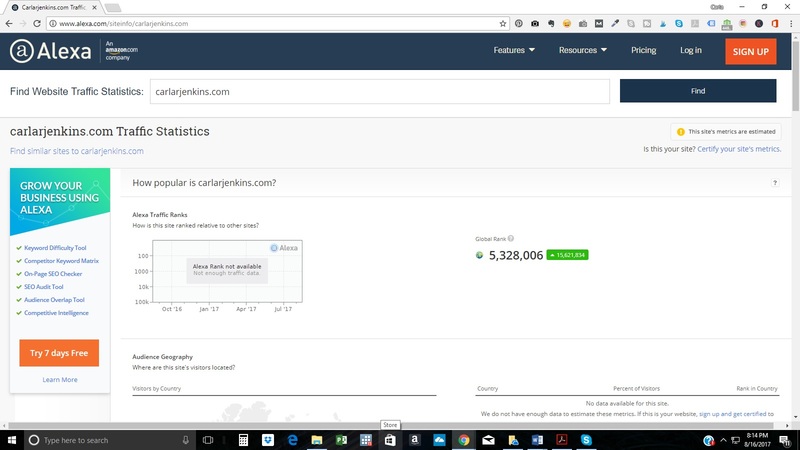 Carlarjenkins.com Cracks the Alexa.com 5 Million Mark! Phenomena Corporation is happy to announce that Carlarjenkins.com has cracked the 5,000,000 threshold! It is currently at 5.3 million! That’s an increase of 700,000 spots from July 28th . Continuation of the Morning Magnet series – I learn from Google Analytics that people start off their days reading my site. I have steady traffic 5am through 8am daily. The Morning Magnet series gives them new updates. Brands have started reaching out to me – a direct result from my above average session duration and Alexa.com ranking. Brands want to work with Phenomena because we offer them our astute audience who’ll not only stay on their ads and sponsored posts but will click their product links. Simply put Phenomena brings our branding partners return on investment (ROI).